OUR understanding of evolution has increased manifolds in the last 150 years, but more needs to be done to demystify the concept. While evolutionary biologists agree with Charles Darwin’s theory of evolution, they also say that ecological diversity is driven by expansion and contraction of occupied niches, rather than by direct competition within existing niches. Scientist Sarda Sahney and her team from the Department of Earth Sciences, University of Bristol, UK, said that biodiversity of today’s tetrapods (a collective name for amphibians, reptiles, mammals and birds) is great. Sahney collected data on when in Earth’s timeline tetrapods lived, their choice of food and habitats they occupied. 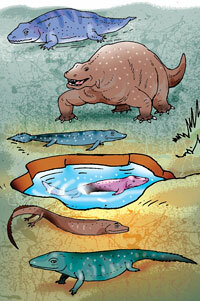 Over the past 400 million years, since vertebrates moved onto land, tetrapod diversity has risen exponentially. The team tabulated data over 66 stages of time, for 400 million years and included 1,034 extinct families in the analysis. Families included were given assigned geographical, chronological and ecological classifications. Those without fossil records and single representative species were excluded. Though a link between global diversity of tetrapods and their ecological niches has been studied before, this is the first time a numerical analysis of the relationship between the two has been done. Analysis revealed a strong (97 per cent) correlation between tetrapod diversity and niches they occupied, which means innumerable species are present on Earth because multiple habitats existed for them. Her team states that “tetrapods have not yet invaded 64 per cent of potentially habitable modes, and it could be that without human influence, the ecological and taxonomic diversity of tetrapods will continue rising in great numbers until most or all of the available ecospace is filled”. Agreeing with the research, T N C Vidya, an evolutionary and organismal biologist at the Jawaharlal Nehru Centre for Advanced Scientific Research in Bangalore, said, “Evolution of tetrapod families due to competition with existing families in a particular area was unlikely. It could be due to their expansion into different niches and subsequent adaptation to them”. Sahney said, “We are not indicating that Darwin was wrong. Our findings are on a different scale than his. On a broader scale, among large groups of animals, competition was not a concern since they had room to grow and diversify. Since one-third of habitable ecospace is yet to be filled, with sustainable living and preservation of habitats, we can watch life evolve on this planet.” The study is published in the August edition of Biology Letters.